Phoenix garage doors repair installs the electric garage door opener which allows you to never get out of your car during bad weather. Simply press the garage door opener remote control to open the door while waiting in the car is one of options that is easily, safely and conveniently available at a higher cost. The garage door opener comes with a remote control which is sleek and very user friendly having built in safety features. We employ only the best safety features in the garage door operating system. This includes the garage door protection mechanism, which detects if something is the way of the door closing with the help of infrared light. There is also a manual release mechanism which opens the door in case the power connection fails. Phoenix garage doors repair also provides for top of the class service for garage door openers with working remotes keypads. It becomes a real issue when the remote becomes non functional rendering the entire system useless especially in rough weather. Faulty belts, chains and screw drives are the most common of problems reported at Phoenix garage doors repair. 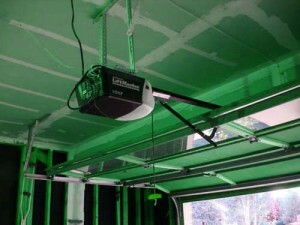 We also look into any need for a new a garage door opener. We also fix anything else along with the reported problem providing parts as and when required. We have a very effectual garage door opener installation in place. When you choose the right company like us to install your new garage door opener you can be sure that you will experience all the intended features and enjoy it for a long, long time.